EmuLa v1.7 build 34 is available! If you install this new version hit [UPDATE] to get the last minute change that allow you to run Genesis games on AROS. FIX : Removed an annoying flickering effect visible when the first gadget of the most recently opened window was hilighted. NEW : License and update servers are no more hardcoded, this means that they can be updated and changed easily and in no time in case of downtimes or service provider changes. NEW : Now EmuLa remembers last main window's position and size. NEW : Hold down RIGHT-SHIFT while EmuLa is loading to reset main window's position & size to the default values. FIX : When EmuLa was updated sometimes the program was reporting an error writing the preferences file. Fixed. NEW : Added World Wide High Score system! It is accessible by the little cup icon on the rom buttons row. 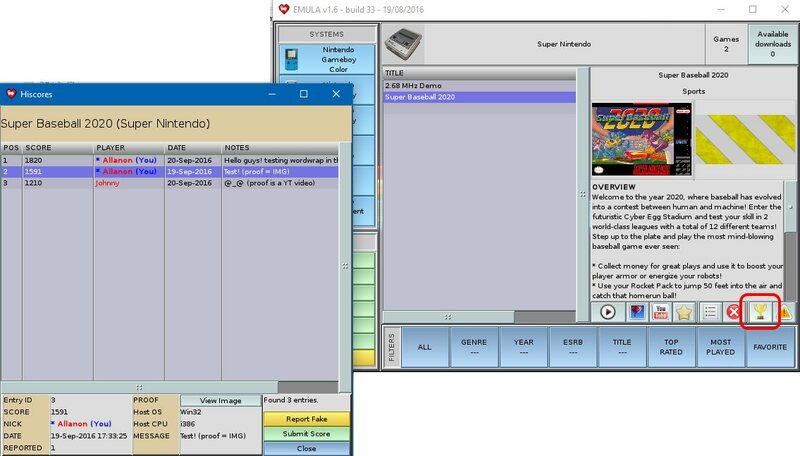 DATABASES => NEW : Support for SuperNES rom set : 2707 roms recognized. SERVER => UPD : License & Highscores server updated for better performances and new features.